CLICK HERE for "John Trumbull" Art Prints! In 1754, Benjamin Franklin penned a political cartoon that would go down in history as the first-ever call for American unity. A snake, representing the colonies as they then existed, divided into sections and the motto "Join or Die". Now this revered piece of America's heritage inspires the Benjamin Franklin Join or Die Ring, a fine jewelry exclusive from The Bradford Exchange Mint. This Benjamin Franklin ring is finely handcrafted with a 99.9% silver centerpiece recapturing the historic Benjamin Franklin statement "Join or Die" in raised relief and plated in 24K gold. A design based on the reverse of a 2006 tribute silver dollar from the U.S. Mint honoring Benjamin Franklin's 300th birthday, this revolutionary ring is the perfect tribute to America's history and ideals. The "Join or Die" centerpiece is bordered by a handsome 24K gold-plated rope design with deep black enamel accents. The side shanks feature a shield and olive branch design based on historic American coins gleaming with even more 24K gold-plated highlights. Inside, the ring is engraved with the words of patriot Patrick Henry: GIVE ME LIBERTY. Strong demand is expected. Don't wait - order now! 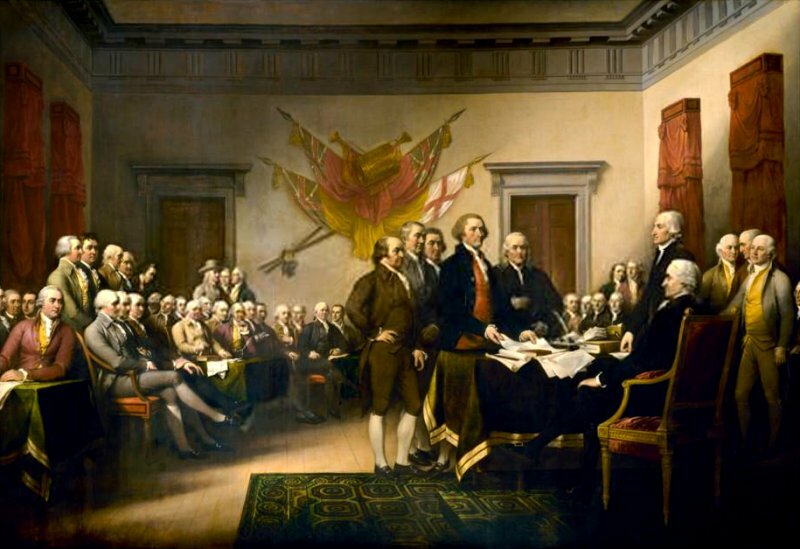 In the summer of 1776, representatives of the 13 original colonies met in Philadelphia. Determined to face the most formidable military power on earth, these American patriots placed their signatures on the U.S. Declaration of Independence, changing history. Two hundred years later, the nation that resulted from their actions marked its Bicentennial. In celebration, special dual-dated coins and $2 Bills were issued. Now, give tribute to our nation's freedom with the Declaration of Independence Heritage of Freedom Currency Set, a unique nine-collectibles-in-one set exclusively from The Bradford Exchange Mint. Your collectible currency set is the perfect symbol of your American pride, showcasing an heirloom-quality reproduction of the Declaration of Independence on parchment-hued paper. Two each of the dual-dated (1776-1976) Bicentennial Coins - Quarters, Half Dollars, and Dollars in Brilliant Uncirculated condition - will also arrive with your set, as well as two genuine, iconic Bicentennial $2 Bills in crisp, uncirculated condition. Plus, your American collectible treasure arrives professionally secured and matted within a museum-quality, mahogany finished wooden frame with protective glass. Strong demand is expected, so order now! A vast fortune in silver pouring out of the Comstock lode led to the Morgan Silver Dollar. And it was the Morgan's 90% pure silver, long vanished from U.S. circulating coins that made collectors view it as the "King of American Coins". Now the King of American Silver Ring, a fine jewelry exclusive from The Bradford Exchange Mint, brings the Morgan's rich silver legacy and historic design to a uniquely wearable treasure. Showcasing a 99.9% pure silver centerpiece and gleaming with 24K gold-plated accents, it's a reflection of American history any man would be proud to wear. Expertly crafted of 99.9% silver, the 1878 Morgan Silver Dollar inspired centerpiece of this ring magnificently recaptures George T. Morgan's eagle reverse design. Both the centerpiece and its setting are highlighted with 24K gold. On the sides of the ring, a raised-relief eagle and flag design is enhanced with black enameling and 24K-gold plating. The inner band is engraved with: The Morgan Silver Dollar "King of American Silver", for the striking final touch. Your eagle coin inspired ring arrives in a deluxe presentation case, but hurry - strong demand is expected, so order now!